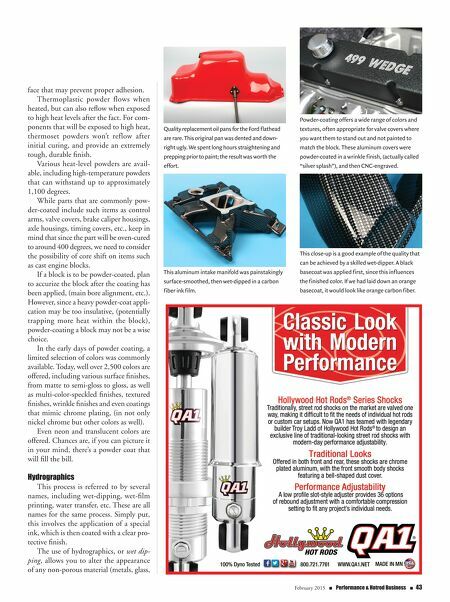 February 2015 n Performance & Hotrod Business n 43 face that may prevent proper adhesion. Thermoplastic powder flows when heated, but can also reflow when exposed to high heat levels after the fact. For com- ponents that will be exposed to high heat, thermoset powders won't reflow after initial curing, and provide an extremely tough, durable finish. Various heat-level powders are avail- able, including high-temperature powders that can withstand up to approximately 1,100 degrees. While parts that are commonly pow- der-coated include such items as control arms, valve covers, brake caliper housings, axle housings, timing covers, etc., keep in mind that since the part will be oven-cured to around 400 degrees, we need to consider the possibility of core shift on items such as cast engine blocks. If a block is to be powder-coated, plan to accurize the block after the coating has been applied, (main bore alignment, etc.). However, since a heavy powder-coat appli- cation may be too insulative, (potentially trapping more heat within the block), powder-coating a block may not be a wise choice. In the early days of powder coating, a limited selection of colors was commonly available. Today, well over 2,500 colors are offered, including various surface finishes, from matte to semi-gloss to gloss, as well as multi-color-speckled finishes, textured finishes, wrinkle finishes and even coatings that mimic chrome plating, (in not only nickel chrome but other colors as well). Even neon and translucent colors are offered. Chances are, if you can picture it in your mind, there's a powder coat that will fill the bill. Hydrographics This process is referred to by several names, including wet-dipping, wet-film printing, water transfer, etc. These are all names for the same process. Simply put, this involves the application of a special ink, which is then coated with a clear pro- tective finish. The use of hydrographics, or wet dip- ping, allows you to alter the appearance of any non-porous material (metals, glass, Quality replacement oil pans for the Ford flathead are rare. This original pan was dented and down- right ugly. We spent long hours straightening and prepping prior to paint; the result was worth the effort. 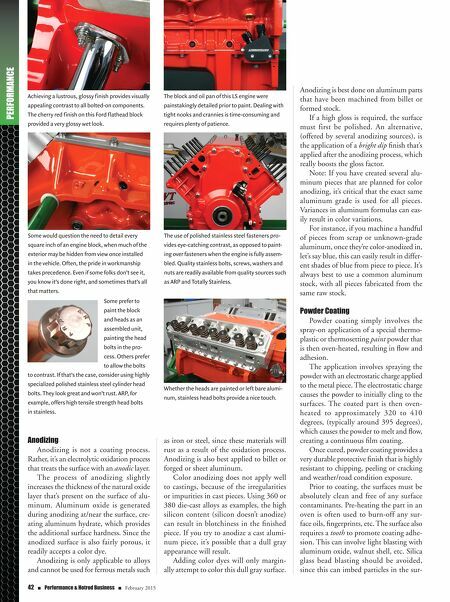 Powder-coating offers a wide range of colors and textures, often appropriate for valve covers where you want them to stand out and not painted to match the block. These aluminum covers were powder-coated in a wrinkle finish, (actually called "silver splash"), and then CNC-engraved. This aluminum intake manifold was painstakingly surface-smoothed, then wet-dipped in a carbon fiber ink film. This close-up is a good example of the quality that can be achieved by a skilled wet-dipper. A black basecoat was applied first, since this influences the finished color. If we had laid down an orange basecoat, it would look like orange carbon fiber.